There’s no denying it. Content Marketing is booming. With 89% of B2B marketers already creating content, and another 6% planning to follow suit in 2018, more companies than ever are generating content. Businesses are investing in this approach for one simple reason; it works. Whether you’ve got a plan in place or not, this is the year to crack your content and keep up with your competition. But you will face content marketing problems! There's no doubt about that. Fortunately, we've already faced a lot of them and have the answers right here. Instead of sending communications like leaflets and product offers to clients, create useful information that aims to solve their problems. Prospects search for and find this information online. Because your company has solved their challenge, a relationship based on trust is formed. When your prospective client next needs your product or service, your company is in their minds. It’s you they contact, not your competitors. Not everyone in your business is on board with content marketing. Some people don’t understand what it is or how it can help and others think the company budget should be spent better elsewhere. A content marketing strategy will likely form part of an overall digital marketing plan. However, it’s still worth exploring your content strategy as a separate, linked scheme. Give yourself time and space to think about what you want to do and why and how you want to do it. Then share your proposal with colleagues to gain their support and bolster your chance of successful delivery. Do you already have a plan in place but you want to take it to the next level? CMI research shows that almost three-quarters of businesses with a documented strategy are planning to integrate it into an ongoing business process. A written document will help you share your plans with other departments and gain their trust. What you do isn't entertaining or interesting. There’s nothing to tell people which means a content marketing strategy is out of the question. If your clients didn’t have a problem for your company to solve, you wouldn’t exist. Because content marketing is all about providing information that solves problems for your clients, anyone can create useful content. By planning your material carefully, you’ll improve your knowledge of your client, understand their pains and come up with content that meets their needs. If accountants can do it (sorry accountants! ), so can you. How lovely life would be if you only had one objective to deliver in 2018. Of course, the reality is very different, and your business wants more leads, greater brand visibility, improved brand recognition plus increased engagement. How are you going to deliver all that? In case you hadn’t guessed, a content strategy will help you create great content that connects with clients wherever they are in their buying journey. Whether they have a problem that needs solving or they’re seeking a new provider, you’ll make prospects aware of your business, and how you can help and deliver better-suited clients to your sales team. A content marketing strategy also supports content distribution via multiple channels. From social media to blog posts, webinars, podcasts, infographics and tutorials, you’ll reach your target audience in a way that works for them. A good strategy ensures all the topics in your niche are covered, and the content you create will resonate with the audience. Your strategy will allow unique elements of your brand to shine through, providing a golden opportunity to build brand awareness, engagement and visibility simultaneously. Considering what you want to say and how you want to say it takes a strategic approach. Like reinforced concrete, pouring content onto the steel core of your strategy strengthens your brand. Without the metal core, your concrete won’t be reinforced and won’t be as effective. If you already have a plan in place but it’s not delivering what you need, 2018 is the year to review, update and tweak until you’re back on target. There’s no getting away from it - creating content takes time and resources. According to the CMI, 47% of those creating and publishing content have challenges with content creation. And 57% say they are not devoting enough time to it. Implementing a content strategy backed up with an editorial calendar allows you to set out your workload in a structured way. Having everything in one place gives you an overview of what you have committed to deliver when it should be delivered. Planning your content in this way will help you set realistic goals with the resources you have. Whether that’s writing two blog posts a month or more. You can also track your content creation against your plans to ensure you stay on track, and adjust as required. Not only do you have a lot of goals to meet this year, but you need to demonstrate a great return on investment to keep everyone on board for next year's strategy! Content marketing is known for its high ROI. Research from DemandMetric shows it costs 62% less than traditional marketing and generates about three times as many leads. Plus, it also nurtures your customers whereas traditional marketing doesn’t. Your ROI will appear in the form of compound returns from the fixed assets that you create and maintain. Think of your web presence as a shop front – the more stock (content) you add the better your shop and the more likely that your customers will find what they need. Now you have your stock in place, it’s easy to set up new shop fronts on social media platforms to attract more customers from different high streets. The more you invest, the greater your returns will be. Quarter on quarter, you’ll be able to compare your yields to your planned goals. The Sales Director and CEO are targeting more sales and they want you to help deliver them. According to HubSpot, companies that publish sixteen or more blog posts each month got almost three and a half times more traffic than those that publish less than once a week. Although volume is important, your content marketing strategy also needs to target your client’s pain points. Useful content that solves problems will establish your website, social media pages and brand as a trusted resource. With a consistent voice, message and personality you’ll develop an authentic relationship so you’re top of the list when your client is ready to make a call. A content strategy can also help you promote your content to your social networks and in front of industry peers. If they share your content, you’re seen by their audience as well as your own. Link to the right people and your content has a greater chance of being shared with relevant prospects generating more leads for the business. What’s more, social media opens a channel of communication with existing and potential clients through social shares and comments making communication a two-way process allowing for extra insights, opportunities and collaboration. Your quality content will also mean your clients move through the purchase decision quicker and reach your sales team better educated about what they're going to purchase. This cuts the sales cycle time and means more leads are converted. All this can only happen if your content answers the right client questions and is connected with other internal departments. Having a strategy in place to determine those questions and making the right content available in the right place at the right time is critical. Your company’s website isn’t attracting the number of hits you need. If it was a high-street shop, it would be invisible! Implementing or refining a content strategy will give you the structures and processes to write well-researched content. You’ll know what your customers are looking for and you’ll be using the right keywords to help them find your quality content. Because your material most closely matches their query and lends insight to their problem, Google will like it, pushing you up the search rankings. Plus, each new post you add to your website is another page for Google to index. While more indexed pages don’t always equal more search traffic, they do give you a greater chance to rank for more search queries. One focus of your content strategy should be to develop content that earns inbound links from external sources. This will increase your website's domain authority and further improve your search rankings. Marketing expenditure is set to pass the $1 trillion mark this year and 39% of companies are planning to increase their content marketing spend from 29% of the overall marketing budget. Even now, your closest rivals are delivering their content strategy, creating a buzz and capitalising on opportunities. While releasing photos of your team culture and blogs relating to your industry, do they have a place in the buyer's journey? You should think about each piece of content you release as something purposeful. If it doesn't have a purpose you shouldn't release it. For example, a team photo may serve the purpose of creating awareness, but will there be anything to to show why the viewer should consider your team? 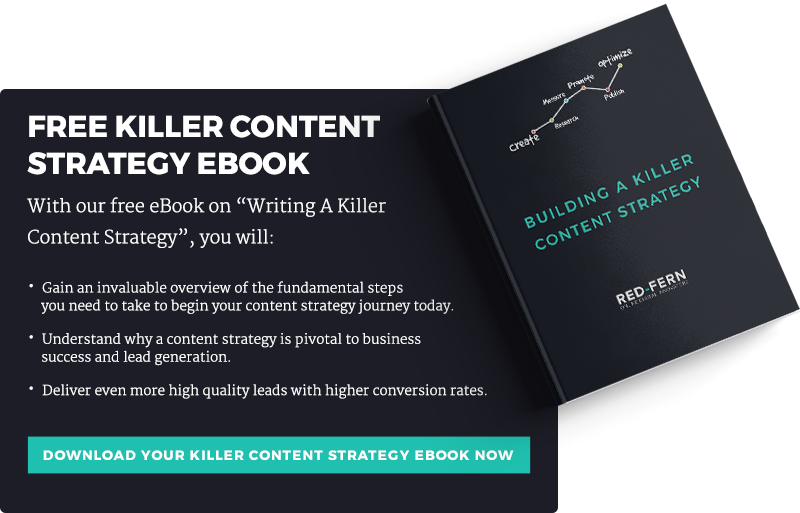 Why Bother With A Content Marketing Strategy? Having a considered strategy is a key component in B2B marketing success, it'll help solve your content mrketing problems! Yet only 37% of businesses have a written strategy in place. If you want to catapult yourself ahead of the competition but still need convincing that a content strategy is for you, read on. If your business faces any of these common marketing problems, put your fingers to the keyboard and write your first plan, or amend your current plan.